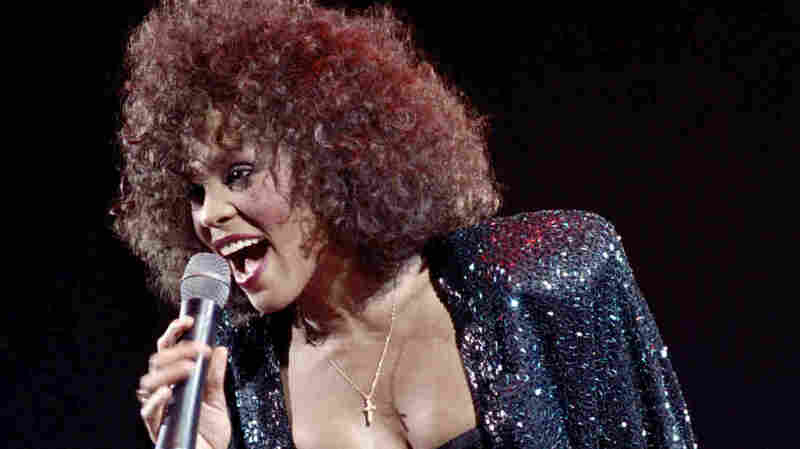 A Radiant, Isolated Star: A New Documentary Tells Whitney Houston's Story Whitney. "Can I Be Me" is an unauthorized documentary that marshals the voices of Houston's friends and former employees to tell an intimate, tragic story. Whitney Houston performs in 1988. The new Showtime documentary, Whitney. "Can I Be Me," includes footage of her world tour in 1999. Or was she the unstable celebrity struggling with drug problems and an enabling husband, let down by those closest to her and isolated by her fame? The new documentary film Whitney. "Can I Be Me" suggests that the struggle to balance all of these issues and more — an identity crisis of superstar proportions — helped lead to the death of one of the best singers in pop music. The movie opens in theaters today and airs on Showtime next Friday. It channels the voices of friends, backing musicians, former record company staffers and ex-employees to tell an intimate, tragic story. "Success doesn't change you; fame does," Houston says in a 1996 interview featured in the film. "You got a whole world of people calling your name and you really don't know them... [Do people think] when we become famous that we have these beautiful perfect lives and nothing is ever on a low? It's a bad conception, because... money doesn't make you happy. It never did." Whitney. "Can I Be Me" offers a story that references how race and class work in America, presenting Houston as a superstar whose early success locked her into a public image seriously at odds with her real life. Houston's saxophonist, Kirk Whalum, summed it up in a quote that became the title of the film. "Her favorite saying was, 'Can I be me?'" he says. "In fact, she would say it so much that we had it sampled: 'C-c-c-c-can I be me?' That was the conundrum. Like, 'Damnit, I have made all this money and made all these people happy. And I still can't be me.'" Directed by Nick Broomfield and Rudi Dolezal, the film shows Houston's career starting when the world of pop music was more strictly segregated. According to former Arista records marketing executive Kenneth Reynolds, record company founder Clive Davis crafted Houston's early records by avoiding material which sounded too close to R&B – in other words, "too black." Reynolds explains: "The company had this image in mind that they were going to create a pop icon. An artist that was accepted by the masses, translating to white America ... Her music was deliberately pop. Anything that was too black-sounding was sent back to the studio." Houston, the daughter of gospel singer Cissy Houston and a cousin of singer Dionne Warwick, had a carefully crafted, girl-next-door image. But that façade was threatened when rumors surfaced about Houston's close ties to longtime friend and assistant Robyn Crawford. The film quotes a friend who says Houston was bisexual; journalist Allison Samuels also speaks about it in the film. "It wasn't cool to have a lesbian affair," Samuels says. "If she was an artist today, she'd be fine. Everything would be lovely. She probably would still be here. But back then, there was this tremendous emphasis on being the perfect girl." There are other stories. An old friend notes she and Houston used drugs together as teenagers. A former bodyguard says he was fired when he tried to alert Houston's managers to rampant drug use by the singer and those around her. Another friend says Houston's husband, bad boy R&B singer Bobby Brown, wasn't faithful and intensified their use of substances. There's even an interview with Burt Bacharach, who helped lead the orchestra for the 72nd Academy Awards broadcast in 2000. He says Houston was yanked from the performing lineup of that show when she seemed erratic and unpredictable during rehearsals. "It was like a train wreck... kinda startling," Bacharach says. "It was so dangerous. This is live television...[If] she sang the wrong song, nobody would know what to do. Ray Charles wouldn't know how to cover that." The film suggests that, when Crawford exited the singer's life after one too many arguments with Bobby Brown, Houston's drug use accelerated. She accidentally drowned in a hotel bathtub on Feb. 11, 2012. The biggest problem here: Because the film is unauthorized by Houston's estate, Broomfield and Dolezal lack access to the most crucial people in her story. There are no original interviews with Clive Davis, Bobby Brown or Houston's mother Cissy Houston; they appear in clips from other media outlets. There is never-before-seen backstage footage from the singer's 1999 world tour and interviews with Crawford recorded then, but no recent footage. Still, Whitney. "Can I Be Me provides a compelling portrait of a supreme talent isolated by fame, dysfunctional relationships and a crushing drug habit, slowly diminished by the same qualities that originally made her a superstar.